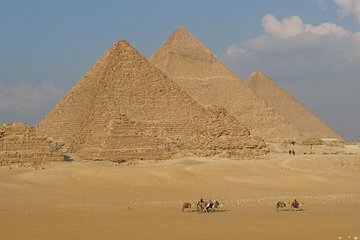 Visit the Giza Pyramids, Sakkara and the city of Memphis on this private, guided, full-day tour from Cairo. See the Great Pyramid of Giza and the Great Sphinx of Giza, plus stop in the ancient city of Memphis. Also, explore Sakkara Pyramid, known as the Pyramid of Djoser (or step pyramid); the Pyramid of Khafre, the second-tallest and second-largest of the ancient Egyptian pyramids; and the Pyramid of Menkaure, the smallest. Lunch and a Cairo hotel pick-up and drop-off are included along with a 30-minute camel ride.